So you are beginning drums! If you are like me, you have probably been a drummer all your life (but maybe didn't know it)! Do you find yourself constantly tapping out rhythms or making rhythmic noises either out loud or in your head? No,you're not crazy--you're a drummer. The first thing that you will need to do is to decide what kind of equipment you will need to begin your study of drumming. There are a lot of choices and the process of selecting your equipment can be rather confusing for the beginning drummer. We have included information about the basic pieces of equipment that you will need, as well as examples of what is available and resources for purchasing equipment at reasonable prices. So, you first of all need some Drum Sticks. There are hundreds of kinds and sizes. For beginning drums, I would recommend that you start with a good basic stick--at least Size "2-B" for regular playing. Invest in a good Practice Pad. There are times when you want to practice without waking everyone in the house! If you are thinking about buying a drum set, in the beginning it would be wise to look for a decent used set or an inexpensive set with cymbals included. Keep the investment low until you have enough experience to know what you really want in a set. 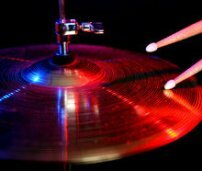 Cymbals can be the most expensive part of a drum set. Some of the new inexpensive sets come with cymbals. This is a good idea because when you know a little more, you can upgrade your set with better cymbals. Special info on beginning to play drums! Now you are standing there looking at your new drum set and wondering "Why do they sound like I am beating on old barrels? ".Well, a bit of customizing is in order! Bass drums also sound different depending on the presence of a front head. Single-headed bass drums will be somewhat quicker, but with less low end. How Do I Tune My Drums? You will find a detailed discussion of tuning and sound at Tuning Drums. Of course, you should take advantage of all of May Music Studio's Absolutely Free Drum Lessons. These lessons cover virtually every aspect of drumming. If you want a more intensive course, try BEGIN DRUMMING. This course is really great and one of the best things about it is that you can put the video lessons on your iPod and take them wherever you go! Take just a moment to check it out--I think that you will be impressed. Leave "Beginning Drums" and Return To "Free Drum Lessons"
Leave "Beginning Drums" and Return To "Absolutely Free Music Lessons"